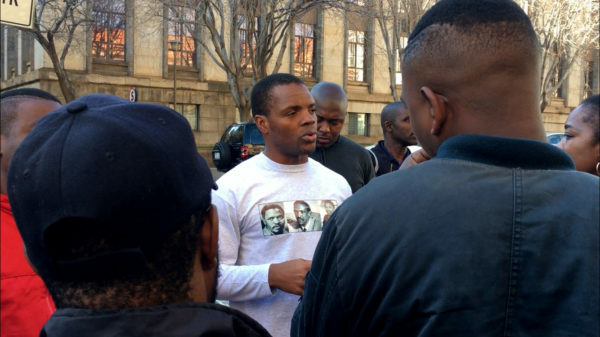 #FeesMustFall activist, Mcebo Dlamini, appeared in the Johannesburg Magistrates’ Court on Monday, July 30, only to have the trial postponed due to multiple reasons. The state had brought forward 20 new witnesses that the defence said they had not known about before Sunday. This meant cross-examination of the witnesses would take more than two weeks and that the two-day trial period would be pushed further as a result. In addition, Dlamini’s lawyer told the court that he had been in hospital the night before due to illness. “The past few days I’ve been having complications with my chest,” Dlamini told Wits Vuvuzela after court had adjourned. “Yesterday I was supposed to have been admitted, but I refused and I left (medical care) last night at around 23:15 because I wanted to come to trial,” he continued. The third reason for the postponement, was that the trial was interfering with the accused’s studies, according to the defence. Although state prosecutor Steven Rubin told magistrate Carlo Labuschagne that he was happy to go ahead with the trial, Khathutshelo Nelson Mathibe, for Dlamini, argued that the trial was interrupting his academic schedule. Dlamini is a fourth-year law student at Wits. Labuschagne asked him to bring his academic schedule when he returns to court on August 20, when a new trial date will be set. The former Wits Student Representative Council president told Wits Vuvuzela that the postponement was beneficial. “With the trial being postponed, it gives us more time to prepare and organise ourselves. The year is moving and we are also approaching exams and those kinds of things,” the 31-year-old said. Mpendulo Mfeka, a second-year LLB postgraduate student who was part of #FeesMustFall came to support Dlamini. He told Wits Vuvuzela that he shares a class with Dlamini and that they have a property law block test next week that counts for 25%. “He needs to be preparing for that test but he has to be going up and down court,” Mfeka said. Following the postponement, Dlamini addressed supporters outside the court. Amongst them were Wits students, students from other universities, non-students and members of the #FeesMustFall movement. Bonginkosi Khanyile, a Durban University of Technology (DUT) #FeesMustFall activist, had travelled from KwaZulu-Natal to support his comrade as he is also set to go on trial in Durban on August 13. The case has been running since October 2016. The charges against Dlamini include violating a court order, public violence, assault, theft and malicious damage to property. They emanate from the 2016 #FeesMustFall protests.